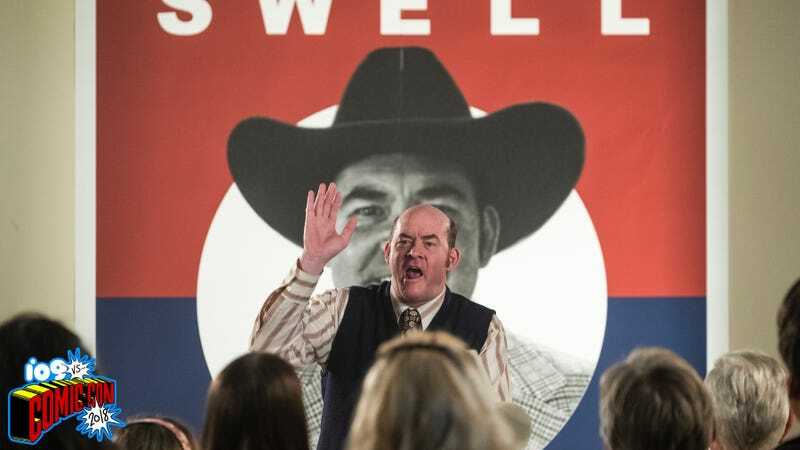 If you thought Trump was bad, wait until you meet this politician, played by David Koechner. Bobcat Goldthwait is maybe not the first name you associate with satirical genre tales, and truTV is maybe not the first channel you associate with scripted anthology series. Don’t let that stop you from seeking out the very funny, very weird Bobcat Goldthwait’s Misfits & Monsters. The show—which has a totally different cast, setting, and story for each of its eight episodes—debuted July 11, so two installments have already aired. The first, “Bubba the Bear,” is a very dark look at what happens when a voice actor (played by Seth Green) is violently stalked by the giant purple bear he plays on TV. The episode cleverly mixes live-action and animation, as well as some unexpected references; at the Misfits & Monsters Comic-Con panel, Goldthwait joked that the episode answered the question “What if Cape Fear and Roger Rabbit had a baby?” July 18 brought “Face in the Car Lot,” which is about a buffoonish used car salesman who runs for president, despite being totally ill-suited for the job, and the intrepid young newspaper reporter who’s determined to take him down. The episode manages to accurately reflect the current political mood in America, even though it’s set in the 1970s and has a subplot about the long-standing rivalry between vampires and werewolves. Next week’s episode, “Devil in the Blue Jeans,” is a Behind the Music/Some Kind of Monster/Phantom of the Paradise/Justin Bieber cautionary tale/mockumentary—which sounds like a lot, but it works thanks to some very committed performances (including Michael Ian Black as Satan). Future episodes will involve the end of the world, a human-mermaid romance, another foray into animation when a pair of slacker musicians (played by comedy duo Jake and Amir) die and are resurrected as bees, and something Goldthwait described as “a Jerry Lewis movie set around the Kennedy assassination.” Each story addresses a larger danger (groupthink, being overwhelmed by one’s creative persona, Trump) as part of its wacky, mashed-up plot, and while Misfits & Monsters owes a debt to shows like The Twilight Zone and Tales From the Crypt, both of which Goldthwait loves, he’s quick to point out the differences, too. Goldthwait is a comedy icon—he’s still probably best-known for the Police Academy movies, though he seems to regard the franchise with a certain amount of friendly disgust—but he’s spent most of his career over the last decade behind the camera, directing feature films and stand-up specials for other comedians. (He doesn’t act on Misfits & Monsters, either.) He told the crowd at Comic-Con that he first had the idea for the show seven or eight years ago, though initially his pitch “went over like a bad fart.” Fortunately for Misfits & Monsters, a lot has changed in the world of TV since then. Goldthwait (left) at the Comic-Con panel with cast members Tara Lynne Barr and Karan Soni. Bobcat Goldthwait’s Misfits & Monsters runs Wednesday nights on truTV.